Let me start by saying that the thought of THE AVENGERS has me flying high. I love everything about this multi-movie, multi-character world that has been building up, and continues this summer with this first of two entries, THOR, to be followed later this year by CAPTAIN AMERICA: THE FIRST AVENGER. Kenneth Branagh is both a talented actor and director. His realm has always been the classics…Shakespeare is this man’s wheelhouse. So many folks were surprised when he wanted to tackle a comic book movie. 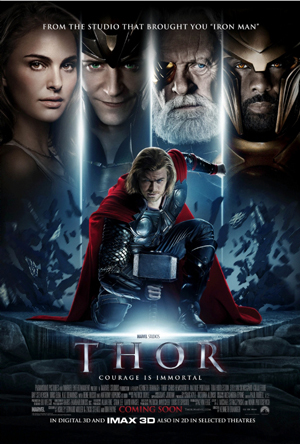 Thor made his debut into the Marvel Universe in 1962. Legendary comic book giant STAN “THE MAN” LEE said he came to a crossroads when trying to figure out how to create a character stronger than the strongest man…why not make him a God? Enough rambling Rhino…get on with it already. THOR was an acceptable entry on the road to The Avengers. I was not floored, but I did enjoy the film. Chris Hemsworth is a charismatic actor who is perfect in this role. As far as casting goes, I generally think they hit the mark with all of the roles. Perhaps the biggest question mark is in Natalie Portman. She does a fine job of conveying puppy love and she is wholly acceptable in the role…but… Yes, that damn BUT. Why has Natalie Portman become the female James Franco? She is in everything these days, transcending all genres. She almost sticks out in the role after her big win as this year’s Best Actress. Yes, there is another prominent Oscar winner associated with this film, but Sir Anthony Hopkins transcends all genres, thank you very much. I guess that isn’t a complaint so much, as it is a random rant. Thor was a good movie, but not a great one. I had fun and enjoyed the movie, but I am using it as more of a springboard to leap into The Avengers. Branagh gives us standard summer fare, and I wanted more. His direction is acceptable, except for some pacing issues, which really is my chief complaint. 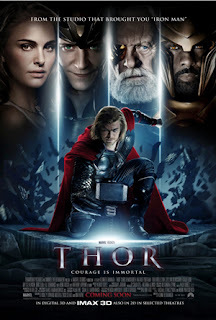 Thor started off strong enough, with a great bit of ethereal storytelling, as we meet our hero and his brother Loki (Tom Hiddleston) as children in Asgard, being regaled with stories of battle and heroism from their father Odin (Anthony Hopkins). The story is of the battle from 965 A.D., when Odin and his warriors waged war against the Frost Giants of Jotunheim and their king Laufey (Colm Feore), to prevent them from conquering the Nine Realms, beginning with the puny, weak humans of Earth. The warriors from Asgard defeat the Frost Giants and seize the source of their power, the Casket of Ancient Winters. 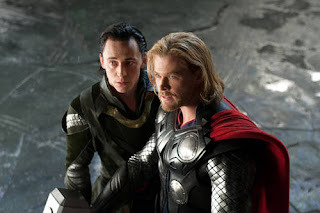 We learn quickly that it will become the fate of either Thor or Loki to become the King of Asgard, whichever of his children the mighty Odin chooses. 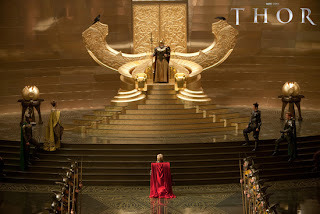 Fade in: It’s coronation day for Thor. He marches with great pomp down the aisle towards his father, surrounded by the people of Asgard. The moment before the crowning occurs, an alarm sounds. It is the enemy of Asgard, the Frost Giants, who have infiltrated Asgard security to try and steal back the Casket of Ancient Winters. Fortunately, Odin had placed in the hall with the Casket, Destroyer, protector of Asgard. Destoryer makes quick work of the intruders, but with his crowning as King disturbed and the people of Asgard threatened, Thor wants to storm Jotunheim to teach the Frost Giants a lesson. 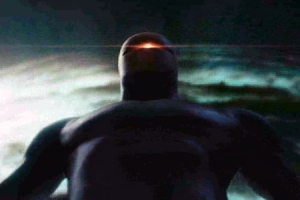 Side note: The parts with Destroyer were loud and visually stunning as attention grabbers, but Destroyer wholly reminded me, in look and sound, of the giant robot GORT, from THE DAY THE EARTH STOOD STILL Anyone agree? 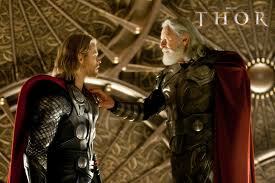 Odin forbids Thor from taking action against the Frost Giants, and of course, Thor defies his father. Thor, with his brother, The Warriors Three, and childhood friend fierce warrior chick come lately, Sif, they cross the Bifrost Bridge to Jotunheim. Side note: Idris Elba (The Wire, The Losers) plays a great Heimdall, gatekeeper of the Bifrost Bridge. I think I could watch Elba in anything…he is great here as well. A glorious battle ensues in Jotunheim, but in the end, Odin must intervene to save the troupe, and in the process, the truce between Asgard and the Frost Giants is shattered. Odin takes swift action, banishing Thor from Asgard and sending him to earth, stripped of his power. 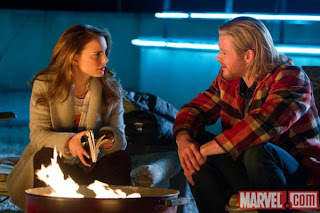 Thor is quickly discovered by two scientists, Jane Foster (Natalie Portman) and her mentor Dr. Erik Selvig (Stellan Skarsgard), along with their intern, Darcy Lewis (Kat Dennings). Thor feels cursed that he has been cast to Earth, and from this point as for most of the rest of the film, we get a pretty standard fish out of water story with Thor learning about life on earth. When Thor was cast out, Odin also cast out Mjolnir, the Hammer of Thor, with a curse that only one worthy of the hammer may wield its power. PS…yes, all the spellings so far are correct, no thanks to spellcheck…all spellings culled from Wikipedia and IMDB. We get to witness Thor’s hero’s journey, but for my tastes, it isn’t as action packed as I would have hoped. This is really the core of my complaint against this film…the middle bits just seemed too dull for my expectations. 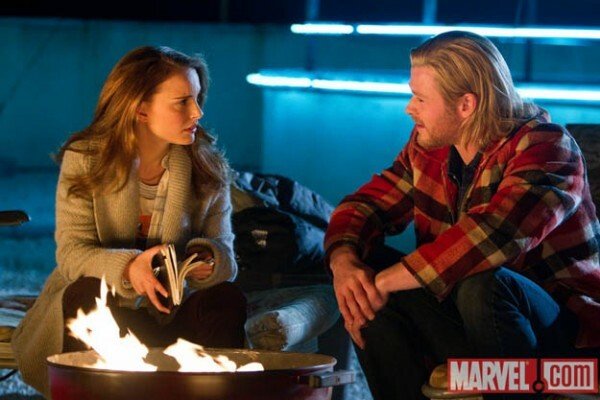 There seems to be more footage of Jane pining over the handsome and muscular Thor, than actually seeing Thor undertaking any kind of adventure on earth. I read a review that compared this saga to the Lord of the Rings films. I see the potential for grandeur here, but I think Thor as a character will be fleshed out more over time as we move towards The Avengers. This film is no Lord of the Rings…but few are. The saving grace for this middle film lull was Clark Gregg, my hero and yours: Agent Coulson of S.H.I.E.L.D. I love this guy and I am glad he has been a constant from the beginning of this run. 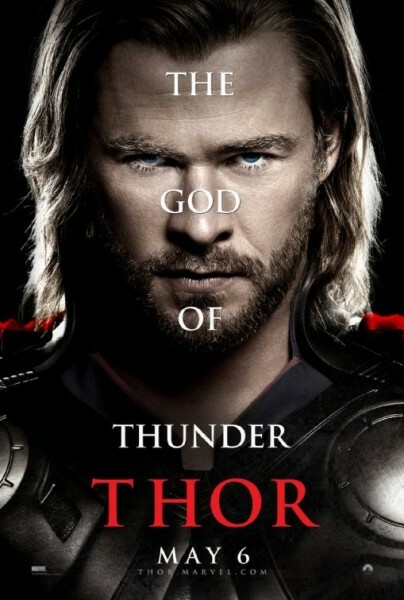 Again, Thor was an enjoyable film, but it just didn’t blow me away the way I had hoped. Vince and Ross, two friends of mine wrote me already raving on this flick. I won’t argue for a minute that there will be folks that love this film. For me, it was a 3.5 of 5 Horn entry into the tale that will become The Avengers. Generally speaking, this movie starts strong, sags in the middle, then finishes strong. Oh…PS…The 3-D in Thor was passable, but not great. Few films have been able to really hit the mark when it comes to HQ 3-D product, but I still like where we’re going with it. I really wish I felt stronger for THOR…but we all know…the heart wants what the heart wants. Okay, that’s a little dramatic, but you get the gist. There are a few good nuggets from within The Avengers universe that pop up here and there and the die hard fans will notice. Be sure to stay until after the credits roll, for the trademark Avengers stinger. 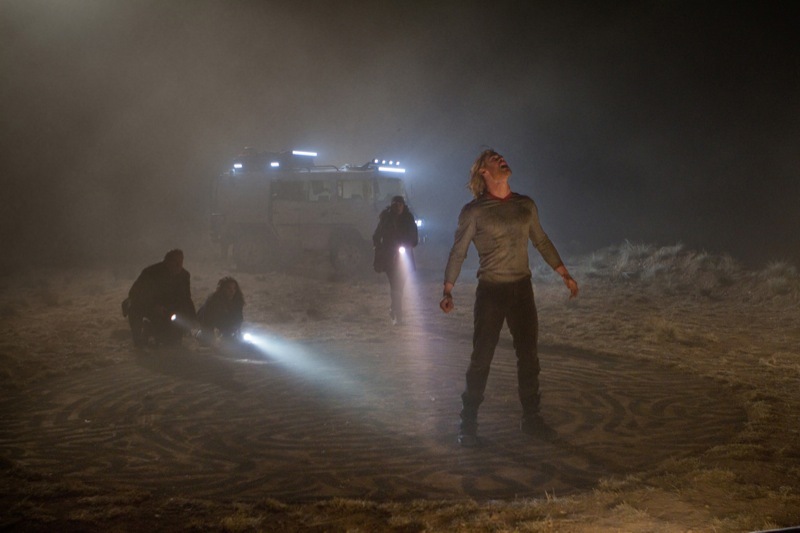 Truthfully, I thought it was a bit weak as an extra scene, but it will clearly be important for entering Summer 2012 with a full understanding of all elements of this world. I was also underwhelmed by the Captain America trailer that led into Thor. Again, I have high hopes and my general interest in the interweaving of all these stories knocks up each of these films at least one notch in my book.